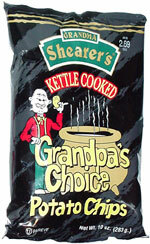 Taste test: These are among the best kettle chips that I've eaten. Very crunchy. They reminded me of Gibble's chips, a brand that I remember eating in upstate New York in the '70s. Smell test: Strong potato and oil smell (typical of a kettle chip). From the package: “Seems to me that it was colder than usual that year at the Annual Frog Leap Festival when i turned to Grandma and noticed that certain little twitch in her eye. I always hated that because it meant that she knew something that I didn't, and that made me real uncomfortable ... like sittin' down in the chicken coop without first takin' a good look around. ” 'I think I'll make some potato chips,' she said. I figured it was my duty to tell her that she didn't know how, so I did. She ignored me, as she always did, and without sayin' boo, fired up her big cast iron skillet. She threw some sliced spuds into some peanut oil, cooked 'em long and hot and the town ain't been the same since. "Sure, there's been plenty of opinions on why they're so good. Some say it's the peanut oil. Some say it's because they're so darned crunchy. Some even say it's Grandma's MAGIC TOUCH. I say hogwash. Everyon knows it's the cold autumn air that makes 'em different. "One thing's for sure ... back then it was just a special treat. These days they wouldn't have the festival without 'em. People would come from all over and line up clear past the pony ride just to buy a bag of those chips. It was all I could do to sneak out for a game of checkers with the boys. But that woman was a smart old hen. She figured by namin' 'em after me that I'd have to stick around and help instead of pickin' up a game or two. Well she was right, and I had to sit there and listen to folks a yappin' about how wonderful they are and sayin' things like, 'Oh Rose, you just have to give me this recipe,' and 'Oh, I bet your hubby just adores these,' and hogwash of that sort. Well, as I know all too well, time goes on. Grandma has been gettin' a lot of mail from folks all over the country, and I've been gittin' in a good deal of checkers lately by remindin' her of how great it was that I came up with that idea for GRANDPA'S CHOICE POTATO CHIPS.